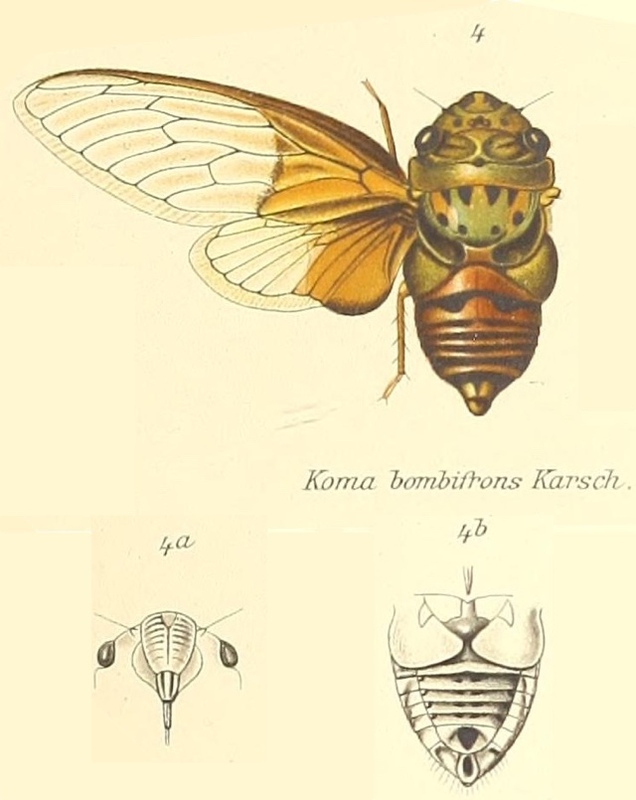 Koma bombifrons (Karsch, 1890). Found in eastern Africa, specifically Kenya, Tanzania, and Zimbabwe. Characters. — Head (including eyes) wider than base of mesonotum, not truncate anteriorly. but frontally produced, about as long as pronotum (excluding its posterior margin); pronotum slightly shorter than mesonotum, its posterior margin about half the length of vertex, the lateral margins- moderately dilated, slightly angulated, but not reaching basal cell of tegmina ; anterior femora with one or more distinct spines on under surface; posterior tibiae with a few slender spines on apical areas; metasternum elevated and centrally sulcate; tympana large; opercula short, broad, in type the margins oblique; rostrum reaching the posterior coxae ; tegmina with the basal cell short and broad; ulnar veins well separated at their bases.